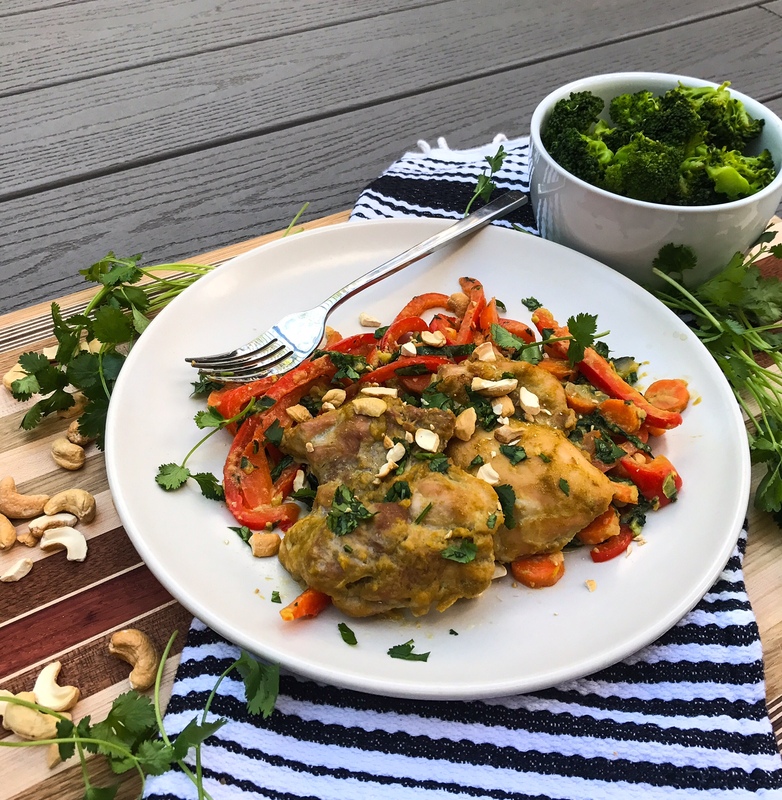 This paleo and low-carb green curry chicken dish is packed with vegetables and flavor. I like to serve this with a side of steamed broccoli or cauliflower rice. In a small bowl, combine almond/cashew milk, coconut milk, ginger, and garlic. Place your chicken thighs in a large bowl. 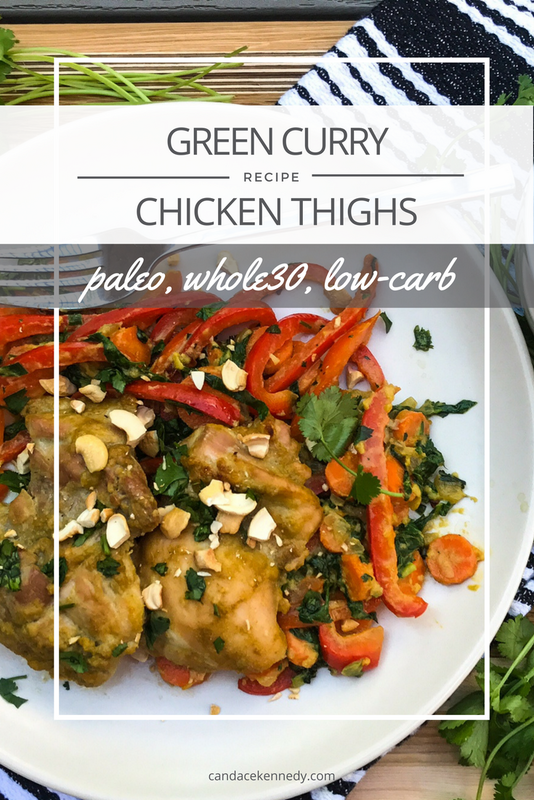 Add half the coconut milk mixture, 2 t coconut oil, and half of your green curry paste. Stir and coat the chicken thighs thoroughly with the mixture. Place the chicken thighs on a parchment-lined baking sheet. Bake your chicken for 25 minutes, until the chicken is cooked through. While the chicken is baking, prep and cook your veggies! To prep your baby bok choy, separate the green leaf from the stem. thinly slice both the stem and the leafy part, but keep them separated as we will cook them at different times. Heat 1-2 teaspoons coconut oil in a medium to large skillet over medium-high heat. Add the onion, bell pepper, carrot, and bok choy stems to the pan. Season with a little sea salt and cook for about 3 minutes, until the veggies begin to soften. Reduce the stove’s heat to medium-low. Add the rest of the green curry to the vegetables. Cook for about 1 minute. Add the rest of the coconut milk mixture, the baby bok choy leaves, and the red pepper flakes and cook for about 5-7 minutes, until the sauce starts to thicken and the veggies are cooked to your desired level. Add the cilantro and give it a good stir. Plate your dish! 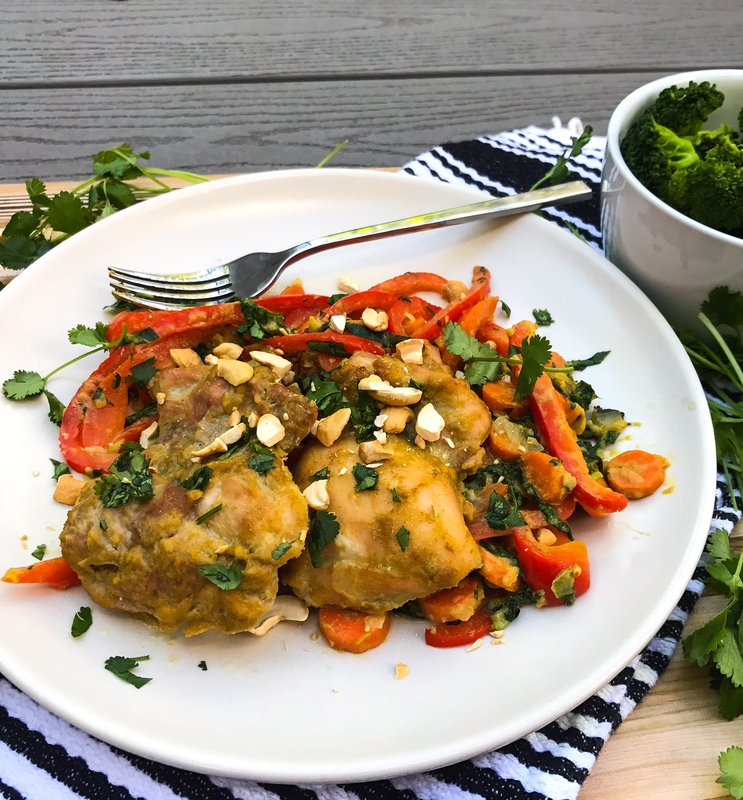 Add a heap of veggies to your plate and top with the green curry chicken thighs. Then top with chopped cashews, lime juice, and extra cilantro. Since every meal is better with more veggies, serve with a side of steamed broccoli or coconut cauliflower rice.